Introduction: Natural orifice translumenal endoscopic surgery (NOTES) is a developing area of minimally invasive surgery. Fundamental challenges of NOTES include development of safe ways to perform translumenal access and maintaining visualization and spatial orientation using a stable operating platform. This study examines the functionality of a new rotary access needle (RAN) device and technique for creation of gastrotomies for peritoneal NOTES access, and functionality and effectiveness of a new steerable flex trocar (SFT) system to enable targeting. 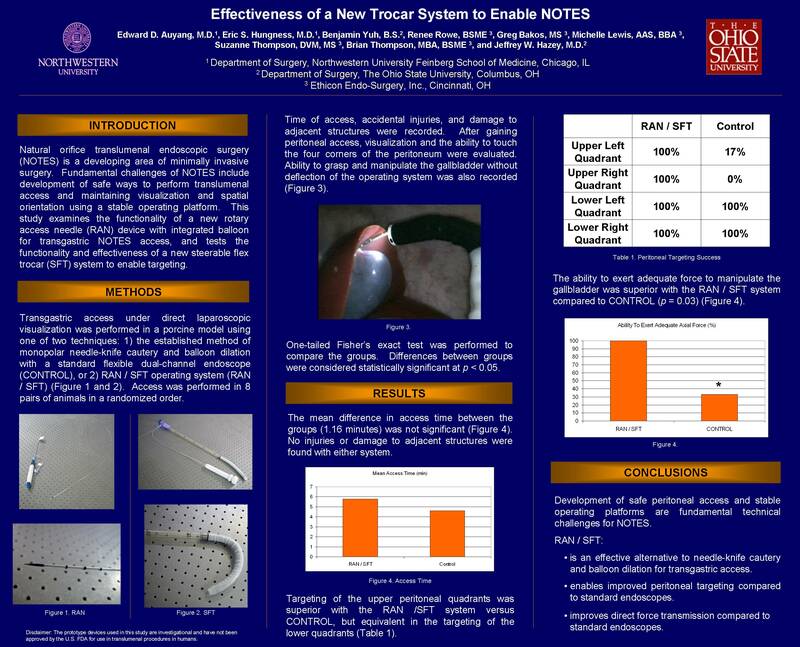 Methods: Transgastric access under direct laparoscopic visualization was performed in a porcine model using one of two techniques: 1) the established method of monopolar needle-knife cautery and balloon dilation with a standard flexible dual-channel endoscope (CONTROL), or 2) RAN / SFT operating system (RAN / SFT). Access was performed in 8 pairs of animals in a randomized order. Time of access, accidental injuries, and damage to adjacent structures were recorded. After gaining peritoneal access, visualization and the ability to touch the four corners of the peritoneum were evaluated. Ability to grasp and manipulate the gallbladder without deflection of the operating system was also recorded. One-tailed Fisher’s exact test was performed to compare the groups. Differences between groups were considered statistically significant at p < 0.05. Results: The mean difference in access time between the groups (1.16 minutes) was not significant. No injuries or damage to adjacent structures were found with either system. Targeting of the upper peritoneal quadrants was superior with the RAN /SFT system versus CONTROL, but equivalent in the targeting of the lower quadrants (Table 1). The ability to exert adequate force to manipulate the gallbladder was superior with the RAN / SFT system compared to CONTROL (p=0.03). Conclusions: Development of safe techniques for transgastric peritoneal access and stable operating platforms are fundamental technical challenges that need to be addressed before NOTES can gain wide acceptance. Under direct visualization in the porcine model, RAN / SFT is an effective alternative to needle-knife cautery and balloon dilation for transgastric access. RAN / SFT provides a more stable operating platform that enables improved targeting and force transmission when compared to a standard dual-channel endoscope.